Many non-ambulatory cows will respond to treatment, but only if it is begun immediately. It’s even more cost-effective to prevent down cows from happening in the first place. 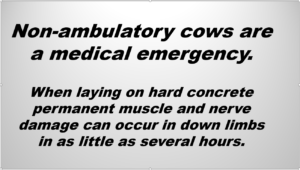 Non-ambulatory cattle are a medical emergency. Every hour that a cow remains untreated laying on a hard surface dramatically reduces her chances of recovery. Non-ambulatory cattle are expensive. Involuntary culling costs alone will be on the order of $500 to $1,000 per cow, which does not include indirect costs such as reduced milk yield, labor and veterinary costs. Because non-ambulatory cattle cannot be marketed the cull price of $700 to $1,000 is also lost. The most common cause of non-ambulatory cows is hypocalcemia (“milk fever”) which typically responds well to treatment, but prevention is far most cost-effective. The herd veterinarian can help in determining the most common causes of non-ambulatory cattle on a dairy and assist with developing the most cost-effective strategies to prevent them. While a variety of different definitions and terms have been applied to non-ambulatory cattle, the term “downer” has been used commonly since the 1950s to describe cattle that, for whatever reason, are unable to stand and walk. Causes of Non-Ambulatory Cattle – Just as with people, a wide variety of conditions can cause cattle to lose the ability to rise. These include infections, injuries and metabolic disease. By far the most common causes of non-ambulatory cattle are hypocalcemia (“milk fever”) and calving paralysis following a difficult delivery. Secondary Recumbency – Studies in the 1980’s described the previously unrecognized condition of “Secondary Recumbency”. Briefly, even if a cow becomes recumbent for a very treatable condition, like hypocalcemia or calving paralysis, the body weight of an adult cow can cause pressure damage to the muscles and nerves of the down limbs. 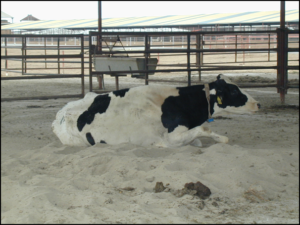 Depending on the surface the cow is laying on (concrete vs. deep bedding) this secondary condition can cause permanent damage in as little as several hours. Cows with such secondary (but permanent) damage may not appear particularly distressed and may in fact be resting, eating and drinking. Prognosis – Without first knowing the initial cause of recumbency and the extent of secondary damage, it is impossible to predict the chances that a given cow will return to the herd. Early examination of the cow may determine why she has become recumbent, helping the producer avoid incurring medication and nursing costs for a cow unlikely to recover, such as those with broken bones, ruptured tendons or infected joints. Perhaps the only good news about non-ambulatory cows is that by far the most common cause of non-ambulatory cows is hypocalcemia or milk fever, a condition that typically responds wellto treatment. In fact, non-ambulatory cows with hypocalcemia are six times more likely to recover with treatment then all other causes such as mastitis, GI conditions or respiratory disease. Regardless of the cause of recumbency however, every hour that a cow remains untreated and every day she remains down decreases her chances for recovery. An outstanding video introducing producers and employees to the prevention and care of non-ambulatory cows has been produced by Colorado State University. 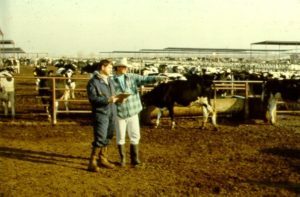 The video is 20 minutes long and is available in both English and in Spanish The video describes aspects of cow examination for producers and employees. Laws Regarding Marketing of Non-Ambulatory Cattle – Preventing tissue from non- ambulatory cattle from entering either the human food chain or the animal feed chain is one of several important “BSE Firewalls”. 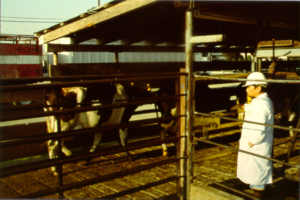 These precautions have prevented a U.S. epidemic of Bovine Spongiform Encephalopathy (“BSE” or “Mad-Cow Disease”) similar to the one that occurred in the United Kingdom and Europe in the 1980s. For this reason, in California it is illegal under both Federal and State law for an auction yard, dealer or slaughter facility to buy, sell or receive a non-ambulatory cow. Because of variable causes and diverse response to treatment, estimating the associated economic loss associated with a non-ambulatory cow is challenging. In general, we know that involuntary or forced culling (due to disease or injury) is in and of itself expensive. 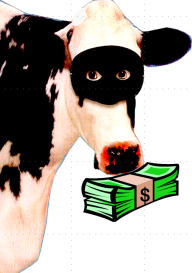 The costs of involuntary culling in early lactation has been estimated to be on the order of $500 to $1,000 per cow, which does not include indirect, hidden costs such as reduced milk yield, labor and veterinary costs. In addition, because non-ambulatory cows cannot be marketed, producers cannot recoup a cull cow price. Depending on expected carcass yield, cull dairy cows in the Central Valley are currently bringing approximately $50 to $80 per hundred weight or about $700 to $1,100 for a 14,000 pound cow. Simply treating a non-ambulatory cow can be similarly expensive. Employees will spend time feeding, watering and medicating the cow as well as assisting the cow to rise. Not captured in any of the costs cited above is the frustrating nature of treating non-ambulatory cattle which can affect employee morale. Given the costs associated with forced culling and treatment as well as the lack of a cull sales price, for economic reasons alone, prevention of non-ambulatory cows is vastly preferred to treatment. With no available market channel, producers faced with non-ambulatory cattle are left with only two options, treatment and euthanasia. Prevention of non-ambulatory cattle however is far more cost-effective and infinitely less frustrating. While some accidents are unforeseeable (and therefore unavoidable), a review of the incidents of non-ambulatory cows on an operation may suggest actions that will reduce similar cases in the future. For instance, if a review of a farm’s medical records reveal that the majority of down cows were caused by hypocalcemia, there may be ration changes that will minimize future cases. Corresponding prevention efforts can be made to reduce or prevent other causes of non-ambulatory cows, such as falls from slipping on wet concrete, heifer dystocia due to large calves or progressive lameness. The herd veterinarian can assist in determining the most common causes for non-ambulatory cows on a dairy and the most cost-effective strategies to prevent them. Given the associated treatment costs and logistics, some dairy producers choose to treat only those cows most likely to recover, such as uncomplicated cases of hypocalcemia. For producers interested in aggressively treating a recumbent cow, the following practices are supported by scientific studies and on-farm experience. Determining the Cause of Recumbency – When confronted with a non-ambulatory cow the first and most important goal should be to determine why she went down and the likelihood that she will respond to treatment. This step is critical, not only to prevent unnecessary suffering, but also to avoid incurring medication and nursing costs for a cow unlikely to recover. Bayer New Zealand has produced an excellent series of YouTube videos describing the examination of the recumbent cow. Dragging a cow by the head, limbs or tail can easily cause additional injury. Only when it is necessary to remove a cow from an inaccessible spot (like a milking stanchion or out of a free-stall) should a cow be dragged and even then only several feet. 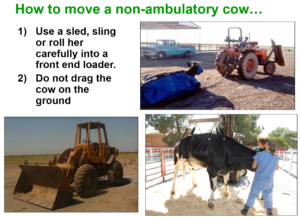 Afterward the cow should be moved to a safe recovery spot using a sled, a commercially available sling or by rolling her carefully into the bucket of a front end loader. Recovery Area, Bedding & Nursing Care – It’s important to locate the patient somewhere safe from predators and protected from the elements, particularly the sun. Heat-stressed cattle have a greatly reduced likelihood of recovery. Deep bedding is important. The best bedding for a downer cow is six inches of sand which minimizes the muscle and nerve damage and decreases sores and urine scalding. Sand also provides more traction then wet concrete which will help the cow with footing when she’s ready to rise. Other types of deep bedding material may be successful. Dairy Australia has produced a YouTube video on nursing care for the down cow. Physical Therapy (Lifting Options) – As described above efforts to treat the initial cause of recumbency will be unsuccessful if we do not prevent secondary muscle and nerve damage to the down limbs. There are least four methods that have been used to relieve pressure to the down limbs: 1) rolling the cow 2) hip lifts 3) slings and 4) float tanks. Rolling – The simplest method to give relief to the down limbs is simply to roll the cow onto her opposite side. Cows should be rolled frequently, at least three or four times a day, although rolling more frequently is better. While this method doesn’t require any specialized or expensive equipment it does involve frequent use of employee labor. Dairy Australia has produced an excellent YouTube video on how to roll a cow to assist in recovery. Hip Lifts – Perhaps the most familiar pieced of equipment used to lift non-ambulatory cattle is the hip lift. 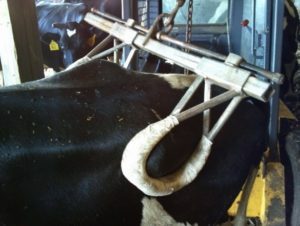 Designed to be fitted around wings of the pelvis (the hooks) the device is lifted until the cow is standing. There are several important caveats about using a hip lift safely. Hip lifts should be used only to assist the cow to stand so that she can support her own weight. A cow suspended by the hip lifts can result in additional damage to the muscle and nerves around the pelvis. Finally hip lifts should not be left on the cow since a fall with the lifts attached can result in serious injury. Dairy Australia has also produced an excellent YouTube video on using hip lifts to assist in recovery. 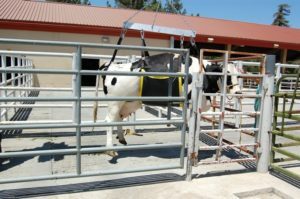 Cow Slings – Lifting may also be accomplished by means of any one of a variety of commercial slings specially designed for large animals. Floatation Tanks – The newest and perhaps most effective method of treating recumbent cattle is the use of float tanks. Academic studies investigating “floatation therapy” have reported success rates ranging from 37% to 55%. Higher success rates have been reported when the patient pool was limited to cattle without catastrophic injury or severe metabolic disease. A frequent observation in these studies is a greater the likelihood of success the more quickly floatation therapy is applied. In one study treatment was successful 70-80% of the time when floatation was started within 24 hours of recumbency. Flotation therapy frequently involves filling the tank with body-temperature water until the cow stands in chin-deep and leaving her there for 8 to 12 hours. The tank is drained and the cow either walks out or is moved to a bedded area. This process is repeated until the cow stands perhaps as long as 4-6 days. In one study cattle that were able to walk out of the tank after the first flotation treatment were nearly 5 times as likely to survive as those that could not. The most common equipment used for floatation therapy is the Aqua Cow Rise System which includes the tank, drag matt and transport trailer but not a water heater which might be needed in colder climates. The high cost of this equipment has stimulated several cost-sharing models including several producers collectively purchasing and sharing tank as well as veterinary clinics or private entrepreneurs renting a tank to producers as needed. 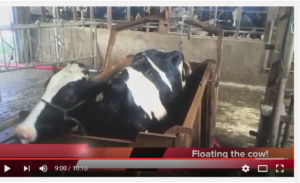 AgWest Veterinary Group has produced an excellent YouTube Video on use of the AquaCow float tank system. 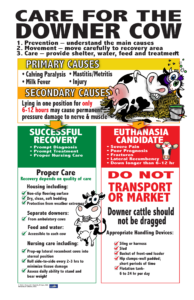 Care for the Downer Cow – Designed with dairy employees in mind, this colorful poster describes in simple terms what basic care needs to be provided for non-ambulatory cows. The Poster is available in both English and Spanish. 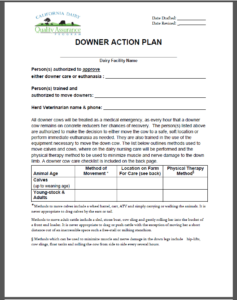 Downer Action Plan – The F.A.R.M. program requires a plan for dealing with non-ambulatory cows and this one-page form can be easily filled up to document your dairy’s procedures. 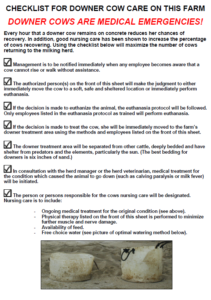 Checklist for Downer Cow Care – Meant to accompany the Downer Action Plan, this checklist provides specific actions for employees to take when a non-ambulatory cow is identified.